Sometimes she ironed while dinner was in the oven; other times, after we ate dinner. 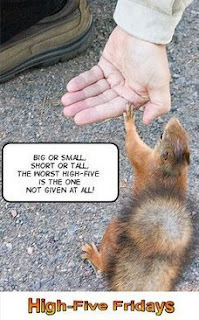 I remember sitting on the floor with my sister watching local news (very vivid memories because of Albert The Alley Cat! ), while my mom stood ironing and talking with us about what we were watching. 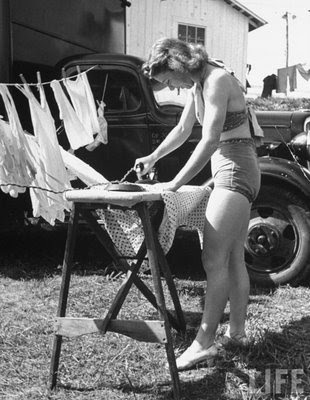 I often consider ironing again just for this reason. In our household, we not only monitor what our children watch on TV but consider television less of a "passive entertainment evil" if our family is discussing what's on. (Sometimes this is part of educating them about what they are seeing; other times it's far more conversational.) If I were ironing, I'd be less bored out of my mind watching shows I do not enjoy but the kids do. I have one for your Grandma blog. Two standard wash cloths were machine sown together on three sides with the forth side loosely hand stitched. Inside was placed the small leftover bits of hand or bath soap bars, that we toss out today. This was then used for your bath. No shower in our house in them days. Dude, I vaguely remember that! Did she make [my sister] and I do that too? He replied that he wasn't sure if his mother did it that long or not... But if it wasn't grandma, then who or how? ...That woman was a saver. For example, she did hoard toilet paper. Seriously -- she had an entire pantry in the basement full of it. When she passed away, we donated hundreds of rolls of toilet paper -- in designer shades & by makers long gone by then. So it's entirely possible she had my sister and I take baths with the soap-saving wash cloths. Thanks, Dad, for the tip & the memories! A Wash Cloth Footnote: One of our kids continues to be confounded by the term "wash cloths" -- she calls them, much to my chagrin, "rags." This because she's almost 13 (her birthday is Sunday!) and for her entire life she's used one of those "shower gel poofs." Plus, she washes whatever dishes that do not fit or belong in the dishwasher with a sponge; so I guess the only small squares of fabric she is used to are rags for dusting, washing floors etc. 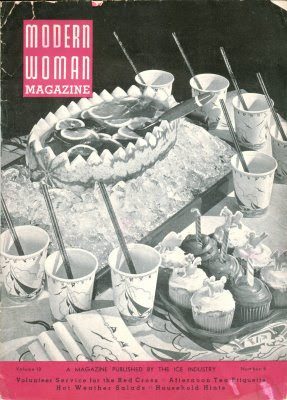 While this 1941 issue of Modern Woman Magazine (V10 n5) doesn't have the recipe or instructions for the adorable cupcakes, I'm inspired to try this with animal cookies and icing. 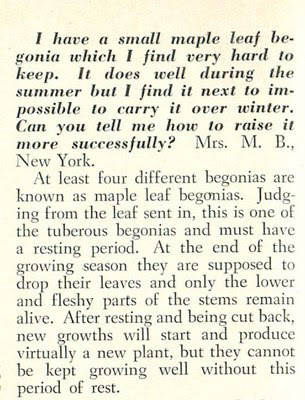 In the March 1952 issue of The Workbasket, descriptions of white molds that form around flower pots, their causes and treatments. 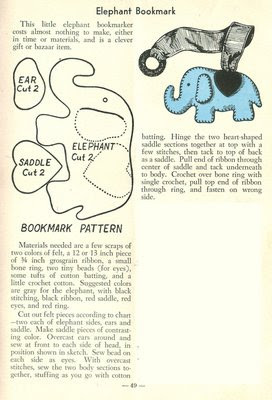 You cannot use this vintage elephant bookmark to win any design contest (it comes from The Workbasket, April 1952), but you can make as many as you'd like and donate them, give them to children you know -- or help children make them for other children and reading programs. I'll admit it, I'm really just showing you these recipes because of the drawings by Florence J. Grant. 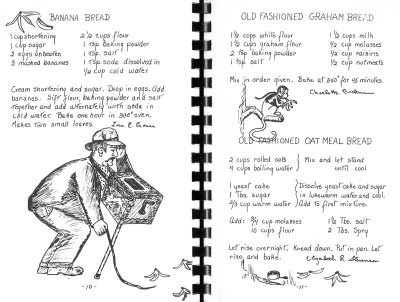 Recipes for Banana Bread, Old Fashioned Graham Bread, & Old Fashioned Oat Meal Bread found in Pot Luck. 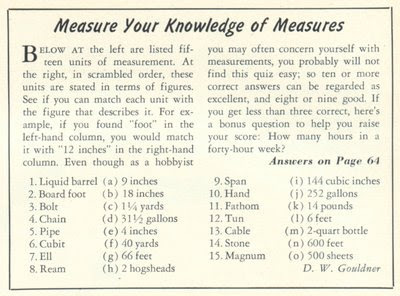 A quiz on the units of meausres found in that March 1951 issue of Profitable Hobbies magazine. 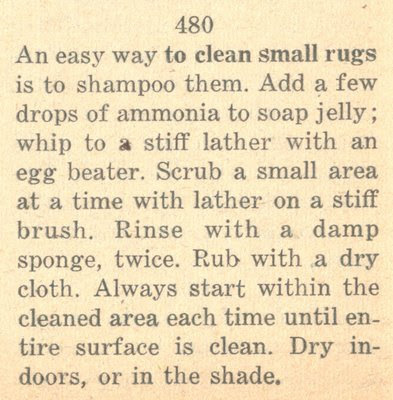 From 1003 Household Hints & Work Savers (1947), tips on cleaning rugs: never shake rugs to clean them, cleaning small rugs, and how to clean single colored rugs. 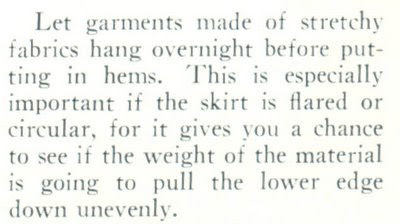 Modern Woman Magazine tip on letting stretchy fabrics hang overnight before hemming so that you can see if the weight of the material is going to pull & lengthen skirt edges or make them stretch unevenly. From Old Stuff, May/June, 1975, a publication which proudly boasted "All paper in this copy of OLD STUFF is 100% recycled." Something which was almost equally true of the content printed on the paper, for all "the stuff" is indeed old articles etc. from antique publications -- save for the obligatory letters to the editor (called "Correspondence") and classified ad section (called "Collectors Market"). The following recipes are said to be from Godey's Lady's Book, 1832. 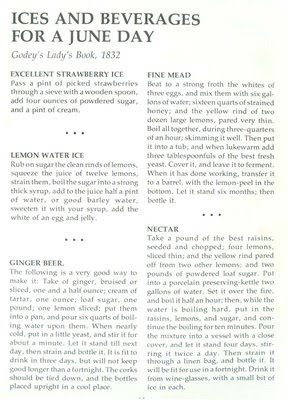 The recipes include, Excellent Strawberry Ice, Lemon Water Ice, Ginger Beer, Fine Mead, and Nectar. 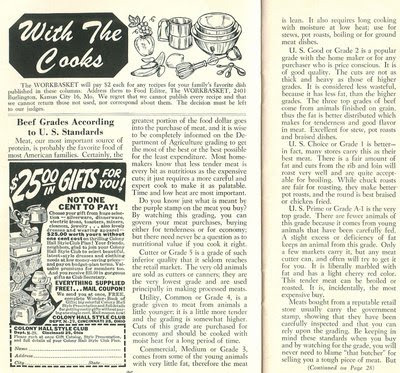 In the January 1952 issue of The Workbasket magazine , information on the US Standards for Beef Grades (for 1952, remember! 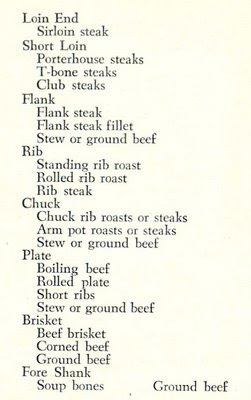 ), main cuts of beef (and their location), and a recipe for beef stew. 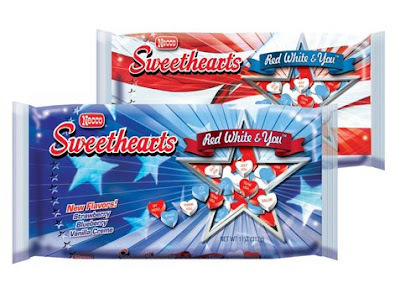 Sweethearts is unveiling a new line of patriotic Red, White & You Sweethearts in all-American flavors (strawberry, blueberry and vanilla crème) which display 13 heartfelt phrases: "I (heart) USA," "Glory," "My Hero," "Miss You," "Proud of U," "Thank You," "USO," "Honor," "I (heart) You," "Brave One," "Home Safe," "Valor," and "Proud." The brand is also supporting the USO with a $75,000 commitment, promoting Operation USO Care Package (OUCP) on its Red, White & You candy packaging as well as supplying Red, White & You Sweethearts for USO care packages sent this summer. You can visit uso.org/sweethearts to make your own donation to OUCP and to download a free Patriotic Crafts For Kids booklet. 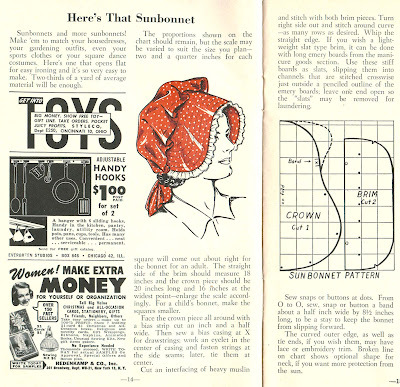 Debutante Clothing introduces Vintage Style Muse Helsinki Pinup, Freelancer's Fashionblog. Here's Looking Like You, Kid talks about the history of rompers & playsuits. Kitsch-Slapped shares vintage party games.